In its standard configuration, the Logosol B751 has a sawing length of 4.8 metres. This sawmill can manage logs of large diameters, up to 75 cm in diameter. With the fixed steps for depth of cut, you can easily set the sawmill to the desired board dimensions, quickly and accurately every time. You get a rigid and extremely functional band sawmill that is best in its class when it comes to sawing. 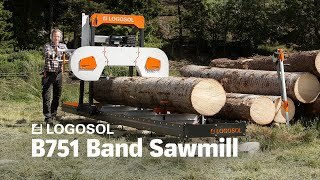 After several years of selling band sawmills from Norwood and other manufacturers, Logosol now takes the next step and launches an in-house developed band sawmill with the focus on user-friendliness and capacity. Logosol’s own band sawmill is Swedish-made and robust, with several well thought-out features that facilitate working with the machine. Its design is revolutionary and offers the best system for manual sawhead setting that you can find on the market.